You can use the IBM 7852-400 modem with Robot Alert and IBM's Electronic Customer Support without switching the modem from SYNCHRONOUS to ASYNCHRONOUS modes (the modem is set up in SYNCHRONOUS mode). You must have an existing Robot Alert modem-type communication job and you must know the name of this communication job's line description. 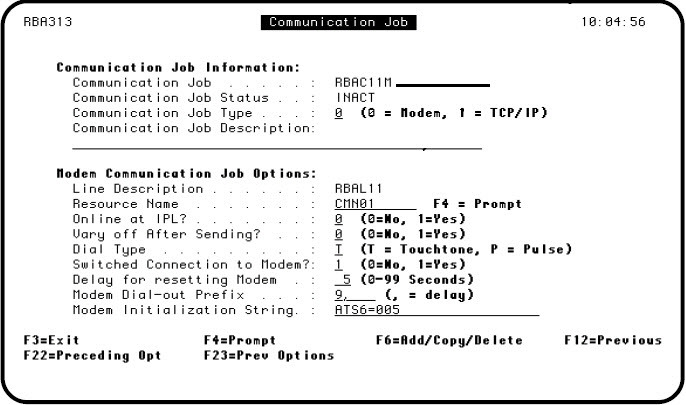 To create a Robot Alert modem-type communication job, refer to the Robot Alert User Guide. To verify the name of a communication job's line description, see the section, "Verifying the Name of a Line Description," below. To change the communication job's line description, your user profile must have ALLOBJ, IOSYSCFG, and SECADM authorities. Vary off the Robot Alert line description associated with the communication job. Enter the command RBTALRLIB/RBASYNCLIN and press F4 to prompt the command. 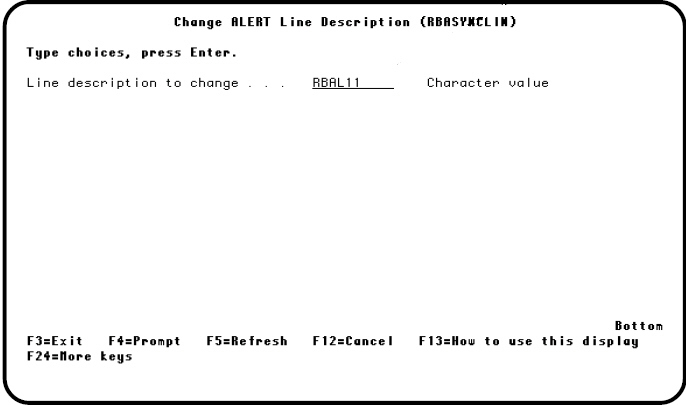 The Change Alert Line Description (RBASYNCLIN) panel displays. Select option 6, System Setup Menu, from the Robot Alert Administration Menu. Select option 2, Maintain Communication Jobs, from the System Setup Menu to display the Maintain Communication Jobs panel. Locate the communication job, enter a 1 in the Opt field to select it, and press Enter to display the Communication Job panel. Verify the name of the line description from the Line Description field. Press F3 to exit the panel.